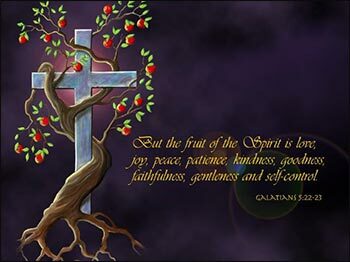 The fruit of the Spirit is love, joy, peace, longsuffering, kindness, goodness, faithfulness, gentleness, self-control. 1. Preoccupation with externals. Though students often murmur and grumble when facing tests in the classroom, there is a sense in which we really want to have them. Tests that measure skill, achievement, and knowledge are even standard fare in magazines. People like to know how they rate. Have I achieved excellence in a certain endeavor, or am I mired in mediocrity? Christians are no different. We tend to measure our progress in sanctification by examining our performance against external standards. Do we curse? Do we drink? Do we go to movies? These standards are often used to measure spirituality. The real test—evidence of the fruit of the Spirit—is often ignored or minimized. This is the trap the Pharisees fell into. We recoil from the real test because the fruit of the Spirit is too nebulous. It is far more demanding of personal character than superficial externals are. It is a lot easier to refrain from cursing than it is to acquire a habit of godly patience. 2. Preoccupation with gifts. The same Holy Spirit who leads us into holiness and bears fruit in us also gives spiritual gifts to believers. We seem to be far more interested in the gifts of the Spirit than the fruit, despite the clear biblical teaching that one may possess gifts while being immature in spiritual progress. Paul's letters to the Corinthians make that abundantly clear. 3. The problem of righteous unbelievers. It is frustrating to measure our progress in sanctification by the fruit of the Spirit when the virtues listed among the fruit are sometimes exhibited to a greater degree by non-Christians. We all know nonbelievers who exhibit more gentleness or patience than many Christians. If people can have the “fruit of the Spirit” apart from the Spirit, how can we determine our spiritual growth in this manner? There is a qualitative difference between the virtues of love, joy, peace, patience, etc., engendered in us by the Holy Spirit and those exhibited by nonbelievers. Nonbelievers operate from motives that are ultimately selfish. But when believers exhibit the fruit of the Spirit, they are exhibiting characteristics that are ultimately directed toward God and others. Being filled with the Spirit means that one's life is controlled by the Holy Spirit; nonbelievers can only exhibit these spiritual virtues to the extent of human ability. “The fruit of the Spirit is love, joy, peace, longsuffering, kindness, goodness, faithfulness, gentleness, self-control.” (Galatians 5:22-23). These virtues are to characterize the Christian life. If we are filled with the Spirit, we will exhibit the fruit of the Spirit. But, of course, this takes time. These are not superficial character adjustments that happen overnight. They involve a reshaping of the innermost dispositions of the heart, which is a lifelong process of sanctification by the Spirit. Lord, let me never become too busy to develop my spiritual gifts, but develop them every day. Amen.